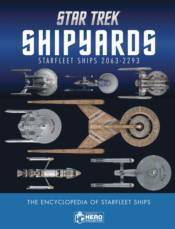 Star Trek: Shipyards is an in-depth reference which includes technical overviews and service histories for each Starfleet ship, and is full of visual effects artwork from the television and film series. Never before has a chronological history of all the Starfleet ships featured in the Star Trek television programs and films been made available to the dedicated fan base of Star Trek. This first volume of the series presents the technical information, service history, and artwork, sourced from the original visual effects models, from the hit television series Enterprise and Star Trek: Discovery through the film Star Trek: Generations. Volume 1 covers over 250 years of Starfleet starships from the Star Trek universe from the first Earth ship to achieve warp speed to the Enterprise-B, the ship where Captain Kirk lost his life in the film Star Trek: Generations. Each ship profile features artwork from the original visual effects models, detailed technical specifications, service history, and annotated views of the ships features. The limited edition comes with a die-cast Enterprise collectible.